Monitor all of your investment accounts, including advisor-managed, self-managed, and your 401(k), from one convenient and powerful dashboard. With WealthGuard, you decide your risk tolerance and asset allocation. If you reach your WealthGuard percentage, you decide your plan of action. When market changes affect your accounts you’ll be the first to know, allowing you to make smart changes to your investment strategy to help secure your future. When market changes affect your investments, you’ll be the first to know. You’ll receive notifications when your portfolio reaches a new high and also when approaching or reaching your WealthGuard Number. In this study, average annual investor returns are compared to the broad financial markets. The results are astounding. 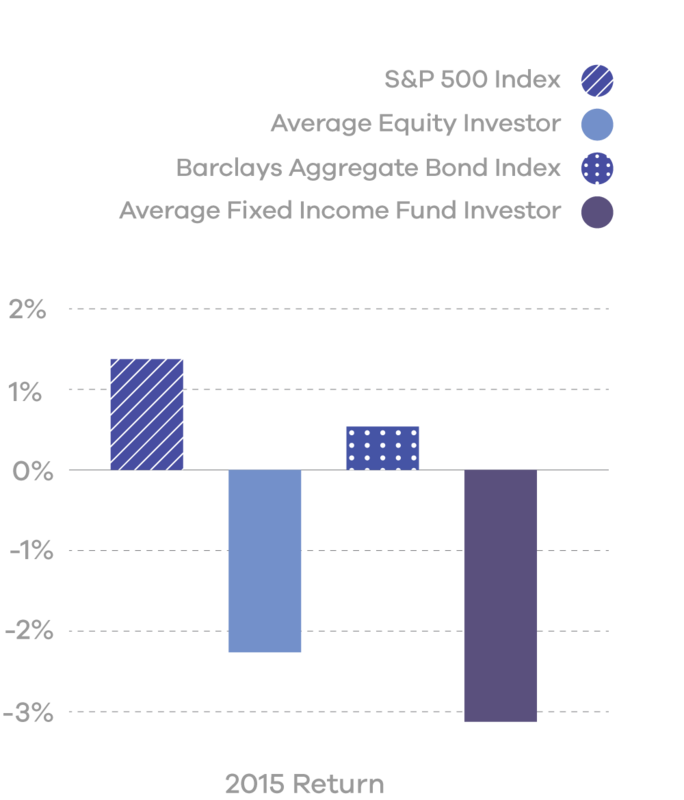 The average stock investor realized less than 1/2 the return of the S&P 500, and the average bond investor less than 1/3 the Barclays Aggregate Bond Index. This occurs largely because many investors make their decisions based on their emotions. After big market rallies, the tendency is to buy high; after market declines, investors get frustrated and change investments to something more conservative. For the past 20 years the average investor returns consistently average about 1/2 the index returns. WealthGuard is based on the principle that investors should start with a risk-appropriate portfolio, consisting of an appropriate mix of growth and income investments. WealthGuarding is more than just a buy and hold allocation of investments. In the real world, markets go up and down. They can be frustrating, difficult to understand, and difficult to stay committed to. But with a proper plan, investing can provide very real long-term rewards. The key is in establishing a WealthGuard Number to each risk-appropriate asset allocation. A more detailed look at how WealthGuard can help you reach your financial goals. What is WealthGuard and how is it different than other account monitoring technology? WealthGuard is the the only account monitoring system that allows investors to define a unique WealthGuard Number on every account they have – no matter where it is managed – as well as on the total of all their investment accounts. Every investor can find a WealthGuard number that is comfortable for them, so you are always in control of how much risk you’re really taking with your money. Is WealthGuard the same as a Stop Loss strategy? No, WealthGuard monitors entire accounts as well as the totals of those accounts. It acts like an early warning system that notifies you and (when you’d like) your financial advisor if there are ever losses in your account that are approaching your maximum comfort level. If this happens WealthGuard can automatically notify your financial advisor – by doing so you can implement a new plan of action to help protect your account from further losses, while keeping you focused on your long-term investment goals. Can I put WealthGuard on my 401(k), even if my employer doesn’t offer it? Yes! WealthGuard works for nearly all accounts, including almost all retirement plans. If you just want it for yourself that’s okay. Better yet, after adding it to your own account, put your company’s retirement plan administrator in touch with us at support@wealthguard.me so we can see about making sure all the people at your company have access to WealthGuard. After all, it’s 100% free on all 401(k) plans. How can I get WealthGuard on my portfolio? WealthGuard is available for free on almost all investment portfolios. It just needs to be set up by a WealthGuard Partner Advisor. To find a WealthGuard Partner Advisor in your area just visit www.WealthGuard.Me/partneradvisor. WealthGuard is a read-only system that does not have access to your actual account number. The information it does track (holdings, transactions, and performance) is all secured by bank-grade encryption. You can read more about the security of WealthGuard by visiting https://www.blueleaf.com/security/. Do I have to change my investments to use WealthGuard? No! WealthGuard works on nearly all investment accounts in the US, including major brokerage firms like Fidelity, Charles Schwab, TD Ameritrade, Merrill Lynch, Morgan Stanley, Well Fargo, Edward Jones, and many, many more. If you do have questions about how you can better position your investments to reach your long-term financial goals, a WealthGuard Partner Advisor is more than happy to help point you in the right direction. How do I see my account information and monitor my WealthGuard value? You can log in to our secure client portal at https://rwa.blueleaf.com/. Once online, you’ll easily be able to track all your accounts, regardless of where they are located. WealthGuard also sends out weekly (or monthly if you prefer) progress reports so you always know where you currently stand in relation to your WealthGuard Value. For those that want the ultimate in proactive communication, WealthGuard also can send a simple and secure text message to your mobile device congratulating you each time your investments reach a new all time high, thereby increasing your WealthGuard Value. How will I know if my accounts have reached a WealthGuard alert or warning level? WealthGuard automatically sends you an email and text message warning (if you authorize text/SMS messages) if any of your accounts reach 75% of their WealthGuard Number. This means if you have a 10% WealthGuard Number, and you have an account that is down 7.5% from its all-time closing high, you’ll get a notice. WealthGuard also sends an alert if you reach your full WealthGuard Number (a 10% decline from the all-time high based on the prior example). In addition to the proactive notifications, you will also see a yellow warning indicator on your online dashboard at the 75% warning level and a red alert indicator should the full WealthGuard Number be reached. Why aren’t all financial advisors offering WealthGuard? WealthGuard is a fresh idea created to address a long-standing problem, so we’re working hard to ensure all investors and all financial professionals have access. Starting a movement – and fixing an industry that has had problems for over a century – takes some time. If you have an advisor you think would benefit from WealthGuard, please suggest they visit www.wealthguard.me/Advisor. What’s the best way to let my friends and family know about WealthGuard? Great question! We love to help people make smart investment choices and protect their investments. Below you will find a couple buttons you can use to share WealthGuard via Facebook, LinkedIn, Twitter, Instagram, or email. Alternatively, you can always just tell your friends and family in person. WealthGuard was created by BlueLeaf Wealth Inc, a leader in simplified financial reporting. WealthGuard.me is operated by FormulaFolio Investments LLC, a SEC Registered Investment Advisor committed to leveling the investment playing field for all investors. WealthGuard is available at no cost and with no obligations to investors. Getting started is simple, takes 30 minutes or less, and is available on nearly all investment accounts at nearly all US financial institutions. Please complete the information below and a partner advisor will be in touch.